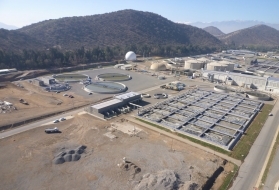 or by artificially increasing Δρ (for instance, by ballasting the floc with microsand introduced when flocculation is taking place); the higher the proportion of sand in the floc, the faster the sedimentation rate will be. 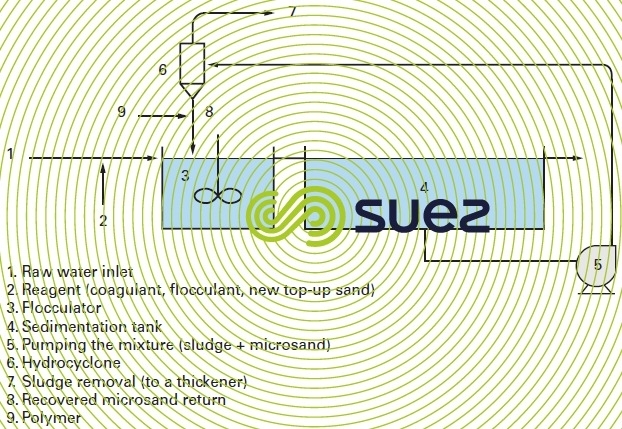 In units that work on this principle (figure 30), clarified sludge must be collected by a pump (5) and routed to a hydrocyclone (6) which, providing it receives very low concentration sludge, will separate out the sludge from the microsand, the latter being recycled in the flocculator (3) where it can constitute up to 95% of the flocculated matter. 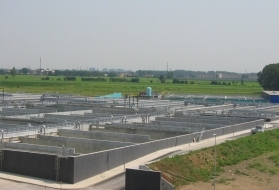 Sludge produced at the hydrocyclone overflow contains 1 to 6 g · L–1 of suspended solids and will subsequently require thickening.